BREXIT is the reason the UK joined France and the US with last night’s massive military intervention in Syria after Bashar al-Assad’s chemical weapon attack, an expert has claimed. 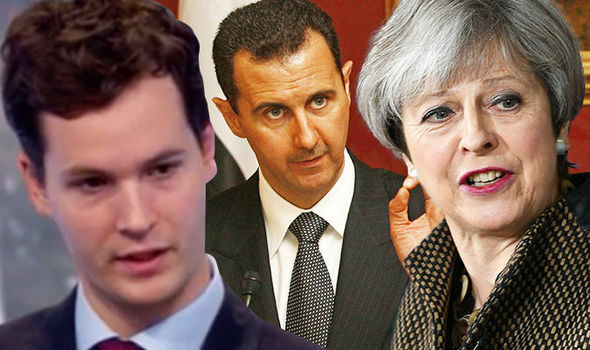 Prior to the launch of more than 100 missiles against Syrian chemical weapons factories and military sites this morning Russia expert Justin Bronk claimed Brexit could be one of the reasons the UK joined with the US and France in military action – even without full parliamentary approval. He told BBC’s Victoria Derbyshire: “I think this probably has more to do with Brexit, in the sense that the UK has left itself in a position where it is really desperately in need of support from the United States as well as other countries around the world. “The UK wants to be seen as a global player to offset some of the influence it is losing within Europe. “To then not back a very personal US call to action from President Trump, especially when the prime call went to President Macron, which was already a bit of a humiliation there. It comes after Syrian dictator Bashar al-Assad was accused of a suspected gas attack which allegedly killed about 70 people in Douma at the weekend. US President Donald Trump warned action would follow the attack from Russia backed Assad – and in the early hours of today he kept his word. Theresa May spent nearly two-and-a-half hours discussing the UK’s response to the suspected chemical weapon attack at Douma in Eastern Ghouta at the weekend – but today at a press conference she said there was no doubt Assad’s regime was behind the attacks and had no option but military retaliation.